Imprint Method: UNIMPRINTED - Tighten the screws of your next promotional event with this 8 tip screw driver! 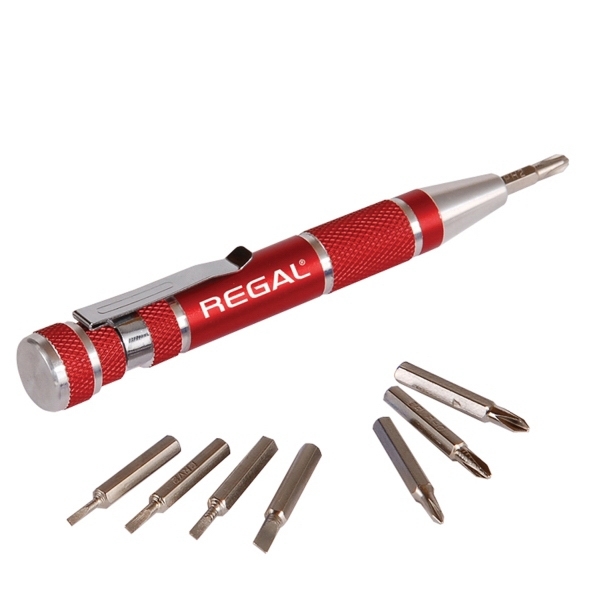 This set comes complete with a clip for traveling, this 8 Tip Screwdriver features 8 interchangeable screwdriver bits (Phillips and flathead - 4 sizes each) neatly stored inside and kept in place with a screw top lid. This is the perfect promotional item for home shows, home improvement projects and outdoor conventions alike! Size: 0.63 " x 4.25 " x 0.63 "